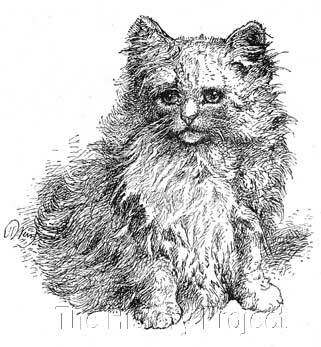 From a drawing by Harrison Weir, Our Cats and All About Them (1889). Courtesy of The Harrison Weir Collection. When fellow author Gillian Vine, wrote her chapter on 'Silver Longhairs' in 1978, she headed it with the title "Ethereal Silvers Win All Hearts"; a statement that could not have been closer to the truth. From the very beginning, silver tabbies, with their striking markings, then lighter silver tabbies and eventually shaded silvers and clear-coated Chinchillas, have caught the imagination of breeders and cat fanciers alike. But it is to the words of Mrs. Balding, (formerly Miss Dorothy Gresham) and the owner of the famed 'Silver Lambkin' that we turn for a clear description of the appearance of clearer coated Silvers. 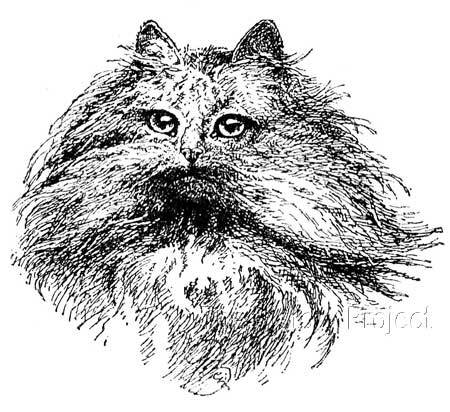 "It is something like twenty years ago that, amongst the competitors in the classes for long-haired tabbies, at the Crystal Palace and other important shows, was occasionally to be seen an alien with the ground colour of the silver tabby, but with very few stripes on the body. 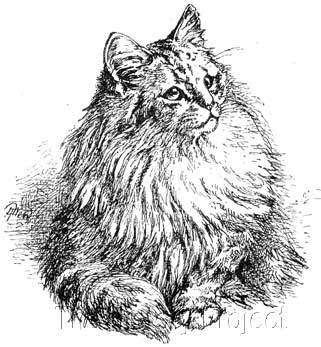 These cats were evidently sports from the silver tabby, so much so that the class for that section was the only one open to them; and, although they invariably showed great quality, breeders were loath to exhibit them in the medley of different coloured tabbies, where one of their chief beauties - the absence of stripes - became a disadvantage." And thus, even before a class for the 'Self-Silver' or 'Chinchilla' was even created, the existence of a clearer coated silver is confirmed, and the desire to emulate the ethereal beauty of 'Sylvie' firmly established. Born in 1879, to some extent at least, Sylvie has been largely overlooked as the 'genesis' of the desire to create the erroneously named 'Self-Silver', or a silver cat without tabby marks or barring, which eventually developed into what became the modern day Chinchilla. "Amongst these outcasts, was a cat of striking beauty, whose like has not been seen again. This was 'Sylvie,' of unknown pedigree ..."
But in fact, she caused a sensation when shown at the Crystal Palace in 1886, when she came to the attention of the judge, and was assessed by the keen and observant eyes of the ubiquitous Mr. Harrison Weir. Although entered by her then owner, Mrs. Christopher, into the only class available to her at that time, she was an unlikely candidate for a win, being as she was forced to be entered into a mixed class of what were generally considered to be poor silver tabbies, lacking in barring. 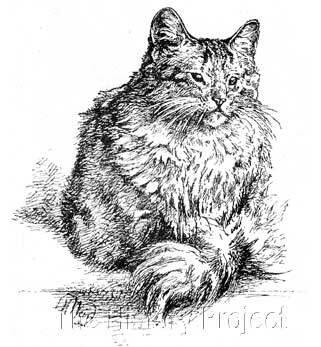 There clearly existed an unrecognised desire amongst breeders to create a silver cat without barring, and the action of Mr. Weir in recognising the obvious qualities of a cat which most closely resembled this desire, no doubt helped to encapsulate and promote the idea amongst fanciers, who from that moment forward seemed to gain the courage to forge ahead with even more determination, in the creation and development of a clear-coated silver Persian. Harrison Weir's courage, in so doing, became the 'wind beneath the wings' to a new generation of breeders of 'chinchillas'. When Mrs. Balding explains that Harrison Weir got "..over the difficulty of her silvery, unmarked coat, by calling her a very light blue tabby, though the puzzle was to find the tabby.." she inadvertently hit upon the crux of what 'he' had also unwittingly achieved. He recognised Sylvie for the beauty of her luxurious clear silver coat, but he continued to refer to her as a 'tabby', and by doing so, he had stumbled upon a truth of fact - that all clear-coated silvers were still genetically tabbies! They remained in essence 'agouti' cats, but with a great difference ... that the pattern was prevented to show itself effectively due to the presence of the "inhibitor" factor. Of course, none of this was known in the 1870's, but what the breeders of the time were unknowingly doing, was 'selecting' for the degree of expression or action of 'inhibitor' factor in their cats, and by so doing, creating bloodlines which would self-perpetuate this action through line-breeding. There are no official records of progeny from 'Sylvie'. But wins by other early silvers with minimal barring followed. 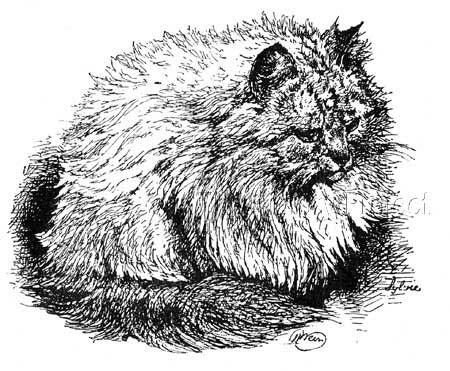 These included Miss F. Moore's long-haired kittens 'Dinah' and 'Chloe', both of whose likenesses were captured by the pen of Harrison Weir. 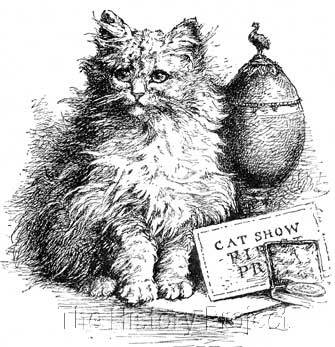 As kittens they won first prize and a medal at the Crystal Palace Show, as well as at the Brighton and Bexley Cat Shows of 1887. "Another chinchilla of the early eighties was Miss Florence Moore's 'Queenie', who would, had chinchilla classes been provided at that time, have been loaded with championships and honours. In colour she was as light as any of our present-day celebrities, and might easily, from her freedom from markings, have earned the dubious compliment of the uninitiated so highly prized by owners of chinchillas of being mistaken for a grubby white." "��two never to be forgotten pairs of chinchilla kittens - Miss Florence Moore's 'Chloe' and 'Dinah' , winners of first and medal on three consecutive occasions at the Crystal Palace, Brighton and Bexley, 1887 (they being the only chinchillas at any of these shows), and Miss Gresham's 'Silver Lambkins', who swept the board in 1888, winning the specials at the Crystal Palace from forty-six pairs of other competitors of all colours - could in each case, trace descent to the Cheltenham stock , 'Chloe' and 'Dinah' through the aforementioned 'Judy' and the 'Silver Lambkins' through their sire 'Rahman', bred by Mrs. Brydges." Above: Miss Mary Gresham's original, 'Lambkin' and 'Lambkin 2', sired by 'Rahman'. Miss Saunder's 'SYLVIE', a full body illustration by Harrison Weir. It seems fitting that Mrs. Balding's own Silver male, a later 'Silver Lambkin' by 'Champion Perso' and out of 'Beauty of Bridgeyate' should be designated as the 'father' of the Chinchilla breed, although a study of silver pedigrees would tend to suggest that his dam, 'Beauty of Bridgeyate' could be equally deserving of the honour as a 'foundation' of this colour variety. In any event, this 'Silver Lambkin' became the prime progenitor of this ever popular breed, so much so, that when he passed away late in 1906 at the ripe old age of 17 years, his death was widely reported in the press, the news reaching even to the farthest corners of the globe! But it is important that we not forget that the dream to produce the Chinchilla, first took flight in 1886, well before the birth of 'Silver Lambkin', with the classic win by a clearer coated silver female, named 'Sylvie', whose natural form and beauty of colour and coat, captured the eye and imagination of the greatest of cat fanciers, Mr. Harrison William Weir. Mrs. Balding was careful to note this for us, and it is to her, to whom we turn, in recognition of her great work with the Silver Persian, moulding what was initially only a hope and a dream, into a worldwide reality. The Book of The Cat, by Frances Simpso, 1903. Illustrations and Quotations as per credits noted.